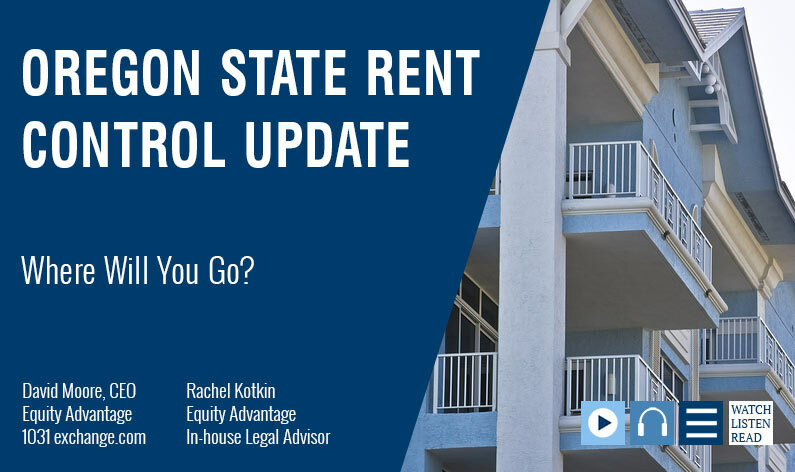 David Moore of Equity Advantage/IRA Advantage talks with their in-house legal advisor Rachel Kotkin about the way the Oregon statewide rent control law may impact property investors. They examine Delaware’s Statutory Trust (DST), triple net (NNN) properties, and tenancy in common (TIC) as options for those looking to make a change. David Moore: Our clientele is not very excited about the new rent control law for a variety of reasons, and they want to know their options. If they want to do an exchange, we discuss with them what’s like-kind. What else is out there that would give them something to buy into if they don’t want to stay in the state. Are there passive investments? What might work that would take care of people going forward? Rachel Kotkin: With any 1031 exchange you can certainly move your funds from the sale of an active investment property into a more passive investment. What’s important when you’re looking at your passive investment options is that you exchange into an interest in the real property itself. You can go into a DST, you can go into a tenant-in-common (TIC), or you can go into triple net (NNN) lease. These are all good options as long as you’re clear that what you’re actually exchanging into is an interest in the real property itself. Rachel Kotkin: If you have multiple investors getting involved, you want to be sure that your funds aren’t being pooled into a new entity where you would be really exchanging a partnership interest rather than an interest in the real property itself. David Moore: So, yes, partnership interest is specifically prohibited from 1031 treatment. How often do you deal with this issue—the vesting issue? Rachel Kotkin: This happens pretty frequently. We’ve got individuals who may think they own an interest in their property, but if you dig into what they actually own, it’s an interest in an entity that owns real property. The problem with that from an exchange standpoint is vesting needs to be the same on both sides of the transaction. The taxpayer, or individual who relinquishes the property, needs to be the same as who receives the replacement property. If you have a multi-member entity, LLC, LP, selling a property and that individual really owns only an interest in, that entity would need to do the exchange, which most of the time is not what they’re looking to do. David Moore: Yes, and the only exception is an entity created under a 761A election, but we just don’t see those. It really never happens, but that exception exists. As far as triple net type goes, there are sponsors out there. You talked about DST, Delaware’s Statutory Trust, you’ve got that offering and then that’s an institutional offering. Legally, it has security and really, technically anything that’s a passive investment for an investor is. Navigating 1031 exchange options takes a professional, and you can count on the whole team at Equity Advantage to help. Your investments are just too important not to have an expert on you team. Give the folks at Equity Advantage a call, 503-635-1031, to get started! Rent Control In Oregon... Now That It's Here How Will It Impact You?